When I was first hanging around Twitter, I came across Nick Cook, who was taking his first steps building a presence as a science-fiction author. I watched over the years as his hard work paid off – he found representation and then a book deal with Three Hares Press (which, by coincidence, was founded by an editor I used to work with). After three books (one for each hare) Nick will publish his next series independently, and asked me onto his video blog to chat about this new and unknown territory. After years of waving hello on line, spaceships passing in the night, our worlds collide properly for the first time. We had so much to natter about that we split the video in two. Part 1 is how I came to self-publish, the rewards and freedoms. When astronaut Major Tim Peake blasted off for the International Space Station, the UK literary community launched a project of its own. One Giant Read is described as ‘a shared reading experience from Literature Works in partnership with the UK Space Agency, Royal National Institute for Blind People and supported by Gollancz, the Poetry Archive and Plymouth University’. I’m beyond delighted that Lifeform Three is included in this month’s edition, which explores artificial intelligence in both the provable world (I refer you to that fetching shot of Benedict Cumberbatch in The Imitation Game) and in speculative fiction. They interviewed me here about writing in the traditions of SF, and reviewed Lifeform Three here. It’s such a nice review that for the rest of today I’ll be wearing One Giant Smile. My guest this week has a novel that spans several lifetimes and puts a new spin on reincarnation – she blends thriller with romance and the supernatural with her story of neuroscientists who have unlocked the secret of reincarnation. She used music to conjure her kaleidoscope of time periods, from ancient China to the modern day, and some of her selections are astoundingly haunting – I’m astonished to discover the 1970s album recorded in the King’s Chamber of the Great Pyramid. Those among you who are reincarnation aficionados will have spotted the reference in the title of this post to the 1980s movie Somewhere In Time, and that was on her Soundtrack too. She is Gwendolyn Womack and she’s on the Red Blog with her Undercover Soundtrack. ‘I am very good at imagining doom. That is why I write novels.’ The other day I posted on Facebook about my horse’s health problems, which I have been worrying about, and finished with those words. Imagining doom. This made me wonder: what characterises the writerly mind? I thought I’d run a diagnostic on the mental routines that make me the scribbling sort. You can tell me yours at the end, or summon Nurse Ratched. First of all, there’s the tendency to conjure chains of events, especially the unthinkable possibilities. We’re sensitive to the skull beneath the skin. That might be a safety valve, as with the many cheery crime writers I know. Equally, it might be a curse. Ask David Foster Wallace, Sylvia Plath. Why, in his life of frequent travel, had he never realised the beauty of flight? The improbability of it? I read that line and thought: I have always seen the improbability of aeroplanes, and the wonder. I have always thought that electricity is astounding, and so is what we do with it. This is the writer’s mind. The questioning never stops. It is like Brownian motion – why, what, what if. What could be different, or taken away? What if I looked from a different angle? As I walked from Moorgate station through the Barbican centre, I passed a glass ziggurat and saw it as a resource. Perhaps a supply of cutting edges. Until the glass ran out, of course. I have always questioned reality. I have always dismantled the status quo and the world around me. In real life, this can make for abstruse conversations. Doh, Roz, what’s the big deal about aeroplanes? Electricity? Whatever. If you say so. But writers are surrounded by big deals, things we can uninvent and meddle with, and a past, present and future that changes at the crook of a finger. 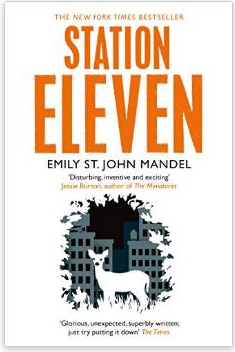 Still with Station Eleven. That world is as real to me as the house I left, and the office I walked into when I finished my journey. People in my imagination, whether put there by a writer or invented by me, are as real as a table you can knock your knuckles on. This post sprang into my mind as I walked past the fragile skyscrapers, still half in my book. I hurried to my desk and hammered it in rough. Musicians are more complete when they’re at their instrument. Writers are more complete when talking to the page. His writing is like being flooded with emotions that you weren’t aware you had, or had subconsciously chosen to repress. Go and befriend her now. And this is why, although I love movies and other storytelling forms, prose is my favourite way to travel. 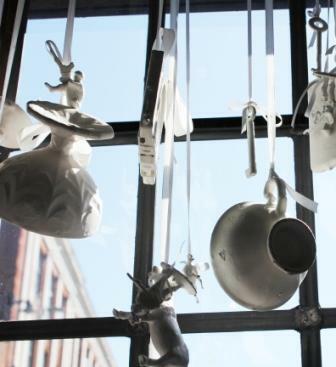 PS The hanging teacups in the pic are the window display of Barton’s Bookshop in Leatherhead, where its proprietor and I record So You Want To Be A Writer for Surrey Hills Radio. Photo by Adam Waters. Do you recognise any of these traits in yourself? What others would you add? Or maybe you’d just like to confirm that I’m in a category of one, and that you’re leaving my subscriber list forthwith. The floor is yours. My guest this week describes a journey – of looking for a life path, of circling around it many times until he found where he was meant to fit. He says he thought he wanted to be a DJ because he loved music, and indeed became a music industry journalist. Then one day he started writing stories – and realised this was how he wanted to use the experiences that music gave him. 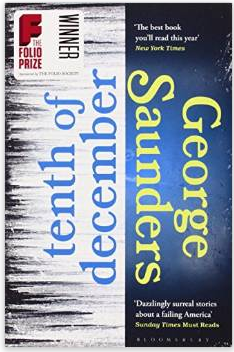 It was clearly a good move as he has been nominated for the Nebula, the Theodore Sturgeon and StorySouth Million Writers awards. He studied fiction under Ursula K. Le Guin and Peruvian playwright Alonso Alegria and is now contributing to Hugh Howey and John Joseph Adams’s Apocalypse Triptych. He is Jake Kerr and he’s on the Red Blog with his Undercover Soundtrack. Science fiction – have we forgotten what it should be? What makes a story science fiction? Is it an otherworldly location, the science, the time in which it is set? I’m thinking about this because of a review I saw this week of a novel billed in The Times as science fiction, which sounded rather disappointing – and it’s put me on a bit of a mission. I haven’t read the book so it would be wrong of me to name it, but it concerned a new planet populated by humanlike aliens. The main threads are the bringing of God to the indigenous people, and the exploitation of its resources by mining companies. But shouldn’t we be doing something better with science fiction (and fantasy)? Bob Shaw says, in How To Write Science Fiction, that science fiction’s defining quality is that it deals with ‘otherness’. Whether it’s in the future, the present or the past, it’s about realities we don’t have at the moment. He also says that the central idea in a science-fiction story is so important it should have the status of a major character. It needs to be developed and explored. It changes what people can do, creates new situations that illuminate the human condition. It adds a new quality of strangeness. And Shaw also says if that concept is taken away, the story should fall apart. One of Shaw’s own short stories illustrates this. Light of Other Days sprang from an idea about an invention called ‘slow glass’, which allows you to see an event or a setting that happened years earlier. And so a man whose wife and child died in an accident can still see them, every day, in the windows of his house. Take, by contrast, Andy Weir’s The Martian. An astronaut is trapped on Mars and has to make enough air, food and water to survive. It’s genuinely an addictive read and I loved it, but it could just as easily be happening in Antarctica or on a deserted island. The science provides the particular challenges and the possibilities, but it does not change the human essence of the story. We’re used to thinking that any story outside the Earth’s atmosphere is science fiction, but they’re not. They’re survival stories. But take the slow glass out of Light of Other Days and you’d have no story at all. That’s science fiction. The Martian is a great read. The other novel may be too. But it’s a pity if the critical press and the literary community are presenting them as examples of good science fiction. Science fiction should be a literature of the imagination. I think it’s a shame if we forget this. The same goes for fantasy – Neil Gaiman’s Graveyard Book is a deeply invented world, and very different from The Jungle Book, which inspired it. We only have to look at our own, real past to see how science fiction and fantasy should grapple with the idea of transformation. Every invention in the history of humanity shows us this. Think of electric light – we can change society and the very fabric of life with an idea like that. With phones – and particularly mobiles – we are reinventing the way society works, saving lives and creating new types of crime. With scientific narrative non-fiction like Rebecca Skloot’s The Immortal Life of Henrietta Lacks we also have a model for writing great science fiction. We can examine the impact of a scientific discovery and the quantum changes it brought, in individual lives and for global corporations. Science fiction works on this same continuum, the scale of human change. A great science fiction idea should allow us to send humanity to startling new places with new advantages, cruelties and injustices. And those are places in our souls, not just other planets. So – rant over. I’m hoping this isn’t too abstruse or marginalising for some of the regulars here, but you do know how I love the strange … Do you write science fiction or fantasy? What are the ideas you’re grappling with? How do you refine them or test if they will be bold enough? Would they pass the Bob Shaw test? POSTSCRIPT How could I have forgotten one of my favourite things about science fiction? It took Dan Holloway to remind me of it in a comment – the reason these ideas prove so beguiling is that they are metaphorically resonant. They enable us to see aspects of humanity that aren’t yet visible. Do read Dan’s full comment below. My guest this week represents something of a milestone. When I was new to Twitter I remember stumbling across his tweets and his blog, where he was taking his first steps in building a presence as a science fiction writer. Meanwhile, he was working on his debut novel, and over the months and years I would catch tweets and Facebook updates about rewrites, and his search for an agent and a publisher. That persistence paid off; he found representation and then a deal with Three Hares Press. Hosting him here feels like the satisfying end of a long journey. He is Nick Cook, the novel is the first in the Cloud Riders series, and he’s on the Red Blog with his Undercover Soundtrack. 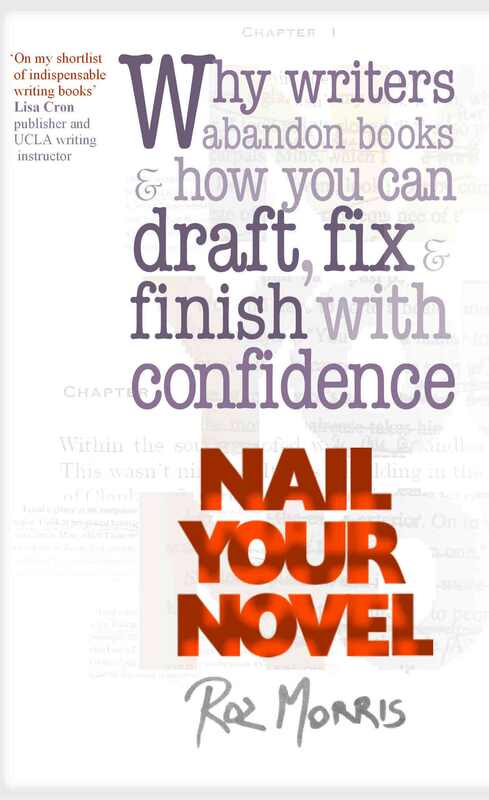 I get a lot of emails about the beat sheet revision exercise I describe in Nail Your Novel. 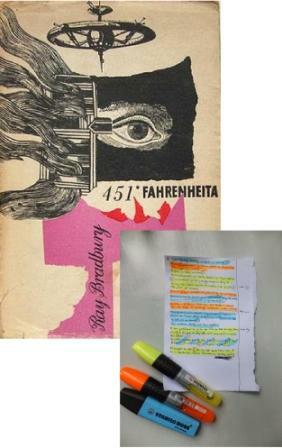 I’ve just prepared an example for my Guardian masterclass using the opening of Ray Bradbury’s Fahrenheit 451 so I thought you guys might find it helpful. First of all, what’s a beat sheet? It’s my absolute rescue exercise for revision. Think of it as an x-ray of your draft. It lets you check the structure, pacing, mood of scenes, character arcs, keep control of plots and subplots, wrangle your timeline – all the problems you can’t see when you’re lost in a sea of words. And you can learn a lot if you make a beat sheet of a book you admire. Here’s how it’s done. You summarise the book, writing the scene’s purpose and add its mood in emoticons. Either use an A4 sheet and write small, or a spreadsheet. Be brief as you need to make this an at-a-glance document. Use colours for different plotlines or characters. Later you can draw all over it as you decide what to change. 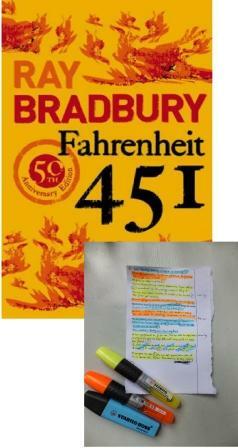 This is the first third of Fahrenheit 451. M ” home. Wife overdosed :0 ! M progressively more alienated & uncomfortable :0 Goes with firemen to house. Steals book ! Woman defends her books & sets fire to herself !! B visits – pep-talk, history lesson. Wife finds concealed book ! Does B know? M confesses :0 ! Is B friend or foe? ? ! Now, even more delicious, what can we learn from Mr Bradbury? Beginnings are tricky – what information do you show? Bradbury gives us a lot, but makes it memorable and entertaining with his use of contrast. We’re probably expecting the home scene, so Bradbury keeps us on our toes and breaks the pattern. It’s no regular scene of domesticity. It’s Mildred Montag’s suicide bid. There follows a horrifying scene where technicians pump her out, routine as an oil change. It builds on those two emotions we’ve seen in the earlier scenes – the brutality from scene one (brought by the technicians), and the sensitivity from scene two (Montag’s reaction). In just three scenes, the world is established – and so is the book’s emotional landscape. A brutal, despairing world and a sensitive man. In the next scene, Mildred is awake, chipper, and has no memory of the previous night. Only Montag knows how dreadful it was and he can’t make her believe it. She is only interested in talking about the new expensive TV gadget she wants. This confirms Montag’s isolation and disquiet. And ours. We are his only confidante. We’re in this with him. In each of those scenes, something is changing – Montag is being surprised or upset (or both). Although Bradbury is acquainting us with the world and the characters, he is also increasing Montag’s sense of instability. As you’ll see from the beat sheet, the later scenes continue that pattern. Look at the emoticons. They show us the mood of each scene and, cumulatively, of the book. But successive scenes of pressure (action, perhaps, or upsetting events) can wear the reader down. That’s one of the reasons why we might have a moment of relief – downtime around the campfire, or a brief flash of humour. These relief scenes often carry enormous impact because of the contrast. Fahrenheit 451 builds this atmosphere of a brutal world, and we notice it quickly. The only relief is in the conversations with Clarice – so the reader’s need for relief mirrors Montag’s internal state. Reader bonded to the main character by the author’s handling of mood. What perfect, controlled storytelling. I could go on, but this post is long enough already. And we need time to discuss! My guest this week says music has always been a companion to his writing. He drafted his first book in restaurants, bars and cafes while travelling the world, and now he turns to music to settle into the writing mood. In his fiction he likes to explore the bittersweet, the unresolved, the questions, the dark side of a strength, and draws inspiration from the songwriters and performers who can break your heart in three minutes flat – while fitting the shape of a tune. He is David Gaughran and he’s on the Red Blog with his Undercover Soundtrack.